For the year ending June 2009, Roberto ranked fifth in the country for both Rookie New Business Development and Rookie Personal Sales. She also received the companyâ€™s â€œMy First Year Awardâ€ and was named to the Silpada Sterling Club, a distinction reserved for the top three percent of the 28,000 member sales force. She earned a trip to the Red Rock Canyon Spa in Las Vegas, as well as exclusive Silpada jewelry, for her achievements. Roberto has been with the direct selling firm since July 2008. 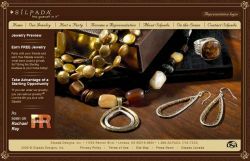 She sells handcrafted sterling silver and gemstone jewelry, helps hostesses earn free jewelry through home parties and guides other women to begin their own Silpada Designs home-based businesses.